Last week, the media reported, once again, that the California High Speed Rail (HSR) project is in its death throes. The latest batch of articles are based on a Nov. 25 decision by Superior Court Judge Michael Kenny. The judge ordered the California HSR Authority to revise a 2011 funding plan before it issues state bonds under Prop. 1A, the 2008 measure that set California’s HSR project going. The ruling also green-lighted work on the Central Valley portion of the project. Plaintiffs include John Tos and Aaron Fukuda, Central Valley landowners in the way of the tracks. It’s one of many suits pending. The Authority tried an omnibus lawsuit, where it essentially sued itself as a defense against the many different legal actions lining up to stop the bonds. Judge Kenny didn’t go for it. “All the judge said is the Authority can’t have blanket validation of the bonds,” said Diridon. There was a third “key setback,” as the Los Angeles Times describes them. On Dec. 5, the Surface Transportation Board of the US Department of Transportation rejected an application from the California HSR Authority to expedite review of the entire 114 mile Central Valley portion of the project. The sticking point is a five-mile section of the 29-mile Madera-to-Fresno segment. Under the worst-case scenario, sources close to the bid said the Authority will renegotiate a $511 million agreement with Tutor-Perini, the construction contractor, to work around it. Meanwhile, Dan Richard, the project chairman, said they will comply with the orders and construction will start as soon as next month. When it was placed on the ballot, Prop. 1A was the only way to give the project a serious financial and political shove forward, by taking it directly to the voters. Still, it was for a $9.95 billion bond issue; a downpayment on the project. The costs for even the earliest incarnations for California HSR were more than three times that much. It’s a different state now. The Legislative Analyst’s Office is projecting $10 billion budget surpluses by 2018. “When I ran for governor in California the first time,” said Jerry Brown at a HSR event, “California’s private wealth, together, was about $350 billion. Now it’s almost $2 trillion.” France, Japan and Germany built modern rail networks with much less wealth. In other words, many are saying Prop. 1A is less important now. And, for future segments, maybe Washington doesn’t matter either. Sacramento may vie to do this on its own, through carbon offsets, the transportation budget, and perhaps through a “franchise bid.” Under this idea, explained Diridon, an Asian or European railway consortium pays to link, for example, Los Angeles with the Central Valley. In exchange, they would collect all the profits from HSR operations for a period of several decades. Bottom line, construction on a segment from at least Madera to south of Fresno will move forward. After that, more segments will be built. There will be more legal battles. The political winds will, no doubt, generate stops and starts. But despite all the doom-and-gloom reporting, California HSR isn’t dead. However, given the many challenges, by the time the first train runs from Los Angeles to San Francisco in less than three hours, everyone reading this may be. Uhh, the federal funds mentioned in this article are MATCHING. In other words, if the state doesn’t match (and CHSRA/Sacramento won’t be able to use Prop 1a funds), it has to RETURN IT. CHSRA is abusing and misappropriating the funds it’s spending. “Then you spend the state part later.” Uh, Mr. Diridon, where do you think you’ll get that money, exactly? Certainly not from Prop 1a. If the CHSRA spends that federal money, then the state will have to either match using General funds (which is what Diridon, Brown and the CHSRA want) or refund the Feds. Also, it is a violation of Prop 1a for CHSRA to begin construction until they have the full approx. 33 billion IN PLACE for the IOS (which CHSRA picked, it wasn’t forced on them). They can’t fund-as-they-go. Prop 1a has taxpayer safeguards as part of the proposition. If you want the money, you have to abide by the requirements that come with it. The Prop. 1A funds are matching. They can’t be spent without money from the Feds. The requirement of the stimulus funds is they be used up by 2017. I’d say the part that’s “doomed” isn’t so much the train, but the local infrastructure that’s being built around it. Why build developments today around a rail line that may not exist for a decade or more? CHSRA Chairman “Emeritus” Diridon is not exactly a reliable source. All his predictions have turned out to be utterly wrong. Including: the cost estimates, the ridership projections, and (of course) private investor interest. Staff took the extraordinary step of asking him to not communicate with the public, so as to avoid further embarrassment. HSR delayed is HSR denied. The cost estimates are wrong because the bids came in below expectations. Nobody can determine whether the ridership projections are correct because the line hasn’t yet opened for operations. According to the business plan, the project isn’t scheduled to open for private investment until FY2015. is it not odd that the majority route follows a bunch of freight lines that need upgrading. the grapvine route doent need the crazy bridges youll see in the tehachepi pass. seriuosly were going to end up with upgraded rail lines with crappy highspeed trains nobody uses because the route will take too long. To offset the bondoggles cost we will let freight use the line. thus upgrading frieght lines that the rail companies can afford to do on their own but wont. all paid for by the Public. dont believe me the Acela allows frieght to run on their tracks as well. this whole thing is a joke that transit advocates need to also jump on board to stop. take that money and invest in the cities and improve mobility there. LOL…You mean the Business Plan that just got shot down by the Judge Kenny? A judge cannot “shoot down” a business plan, silly! Kenny ordered the rail authority to redo its $68 billion funding plan before continuing construction, a process that could take months or years. He had previously ruled that the authority abused its discretion by approving a funding plan that did not comply with the requirements of the law. The picture is mis-captioned. 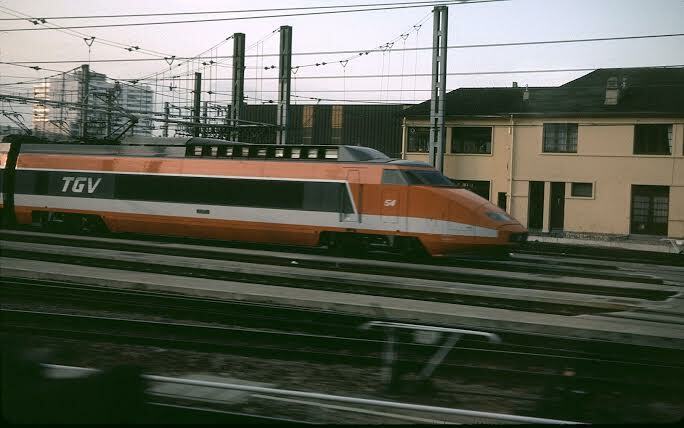 That is a French High-speed train, but it is not on a high-speed rail line…well, not by French standards. And that is exactly is exactly something which many in the local media can’t seem to understand: That a train like this could run at regular speeds on conventional track until it gets to the high-speed portion. That is exactly what the TGV does on many services such as Paris-Lausanne. DrunkEngineer. The information you’re quoting is wrong. Judge Kenny specifically states that CaHSRA can honor its construction contracts. He specifically refused to issue an injunction restraining construction. Yes, because some funds are Federal and he had no jurisdiction over that. The point, however, is that Diridon’s “business” plan was so much vaporware, that it could not survive a court challenge. No, your previous post is just wrong. They “CAN” continue construction–and that’s exactly what they’re doing. Furthermore, Judge Kenny DID have jurisdiction to enjoin the Authority, a state agency, to stop construction. In fact, that was part of what the Plaintiffs requested. He declined to do so, pending further proceedings. The reason that freight runs on the Northeast Corridor is that the Pennsylvania Railroad built the NEC. When it was conveyed to Amtrak ownership in the 1970’s after the PennCentral merger PC kept the right to run freights. When Conrail (nee PennCentral) was split between Norfolk Southern and CSX, NS got the freight rights on the NEC. However, now that it has significantly upgraded the connection between Manassas Junction and Hopewell in Virginia and the old Reading line through southern Pennsylvania few NS freights use the NEC north of Baltimore. There was not some evil conspiracy among the railroads to co-opt Amtrak’s line. They built the damn thing. Now your wish to improve transit in cities is a good one. I’m not convinced that even true HSR will compete in the LA-Bay Area market all that well. There are five airports sprinkled around the LA basin and three in the Bay Area. There are, generally speaking, frequent flights between all three northern and all five southern airports. Downtown LA isn’t really all that much of a residential center, though certainly central San Francisco is. 3-hours on a train vs. flying? If it’s cost competitive, there’s no contest for me–air travel is like medieval torture these days. And with all the extra time required for this abuse, it’s not any faster. Roll onto a train, get a couple hours of work done en route, roll on your way at the end–what’s not to like? Longer legs? That’s different. “You hear that there are no silver bullets, but this really is a silver bullet” High-speed rail powered from electricity will help wean people from carbon-emitting transportation.